Over the past 10 years or so I have done my fair share of craft shows. Often times deciding whether I'll do it based on the cost of space/table etc... And early on, I learned a lesson. 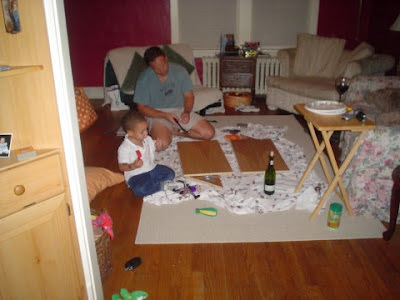 It was summer of 2004, and I'd made a big splurge, spending $165 to get a table at the October craft show, Art on the Avenue in Alexandria VA. It was truly my first 'real' craft show, and I really put all my efforts into making it work. In addition to the cost of the table, I spent another $50 with a local contractor who made me three angled boards to display my jewelry on (best $50 ever spent for shows, I still have these pieces and use them every time I do a show!). And miscellaneous $$ on tablecloths, business cards, printing up signs, boxes and so on. All told, I probably spent about $300 to do this show. And then there was the jewelry. I had some pieces in my inventory which I really loved, poured my heart and soul into and frankly I didn't really want to part with them. But I only had a couple pieces like that. So for the months of August and September, I turned into a factory creating necklace and earrings sets for this show. And then when I thought I had enough of those, I made as many earrings as I could. Truth is, I had no idea what kind of reaction my strung jewelry would have at an event like this. My best friend and her family came down to assist at this event. The night before the men secured nails in the boards to hold the jewelry. We also sorted through all the jewelry with price tags to price everything. I really wanted to sell a lot of stuff so I priced things fairly if not somewhat inexpensively. And then, as we were in the midst of pricing things, we came across an amber colored 9-strand piece with bali silver. This was definitely one of the pieces I poured my heart and soul into, and felt my 'artistry' was truly showcased in this piece. When it was time to put a price on it, I realized I didn't even want to part with it! These glass beads cost me about $9.00, the other supplies cost about $10.00, and it probably took me about two or three hours to construct the piece. So for this one, I went way over my 'typical' hourly rate and wrote $280. I'm not really sure where that number came from, except a place in my head that said, "I don't really want to sell you, you pretty little necklace!" And a handful of my really special $280 pieces. Literally thousands of people came through the event. 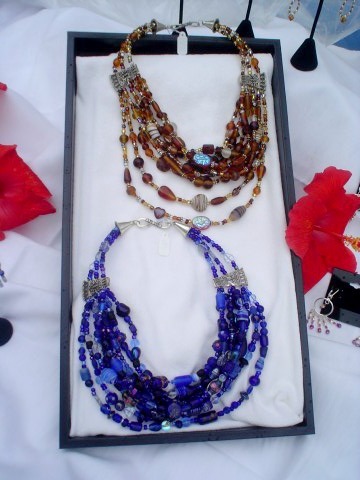 At one point a woman came to my booth and honed in on the amber 9-strand necklace. She put it on, she took it off. She walked away, she came back. She walked away again, she came back with her husband. She walked away again, and came back with her checkbook and very happily wrote me a check for $280. Honestly, I felt a little sick to my stomach upset, but happy at the same time. The rest of the day was rather dull. I'd spent an awful lot of time making all my necklace and earrings sets. Only one or two sold. About three pairs of chandelier earrings also sold. And that was about it. I learned very quickly that it isn't quantity that sells, but quality. I learned that I am much more likely to sell one really beautiful piece at $280, than I am to sell 28 pairs of $10 earrings or 56 pairs of $5 earring! Stay tuned for tomorrow when I use the letter "R" for a REVEAL of a Spring Fling Kit challenge!!!! 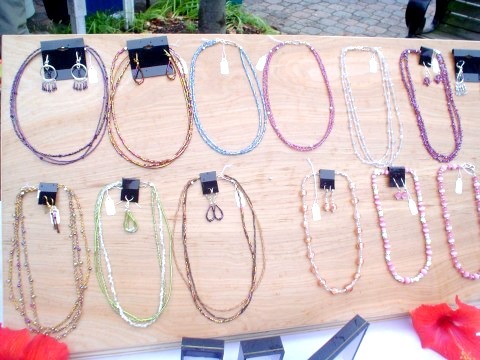 I did my first craft show in November 2011 and I brought my entire stock of sale items with me, but I priced everything low, except for the necklaces made with expensive lampwork beads, and those were only $35. I did fairly well at the show, but that said, all my friends showed up and bought my stuff. A few strangers purchased earrings too which was cool. I'm just so afraid of rejection that I don't put myself out there like I should. Great post! I'm preparing for my first craft show, and appreciate the excellent advice. Craft shows can go from one extreme to another. I've done some where i took virtually nothing at all, and others that did well. I've been doing them for a while, and still have no idea what 'makes' one and what doesn't. I have only done three craft shows since I started making jewelry. The first one I sold a few items, but the second and third time I did not sell anything. I did my first open house in November last year and made over 600.00, so I think for me it will be open houses that I will do and in home jewelry parties. I think it more or less depends on which way the wind is blowing that day, so to speak, as to how well one will do at a sale.